The following is a list of works cited on this website. Many of the sources are available at The Center for Volga German Studies at Concordia University and The American Historical Society of Germans from Russia in Lincoln, Nebraska. ​40th Anniversary Second German Congregational Church 1913-1953. Portland: Second German Congregational Church, 1953. Print. Churches along the Oregon Trail: A History of Churches Identified with the Central Pacific Conference of the United Church of Christ. Portland, Or. : Central Pacific Conference of the United Church of Christ, 1976. Print. Ebenezer Congregational Church Seventy-Five Years 1892-1967. Portland, OR: Ebenezer Congregational Church, 1967. Print. Evangelical Congregational Church 75th Anniversary 1913-1988. Portland: Evangelical Congregational Church, 1988. Print. Garbage Collection and Disposal in Portland. Publication. Portland, Oregon: City Club of Portland, 1955. Print. Seventy-Five Years, 1892-1967, Ebenezer Congregational Church, Portland, Oregon. Portland, OR: Ebenezer Congregational Church, 1967. Print. Zion Congregational Church 40th Anniversary Book. Portland, OR: Zion Congregational Church, 1954. Print. Zion Congregational Church 50th Anniversary Book. Portland, OR: Zion Congregational Church, 1964. Print. "A Brief History of the Zion Congregational Church." Zion Congregational Church, Portland, Oregon, 1914-1967. Portland, Oregon: Krieger, 2001. 469-70. Print. Abbott, Carl. Portland: Gateway to the Northwest. Northridge, CA: Windsor Publications, 1985. Print. Abbott, Carl. "Where Are Portland's Vanished Immigrant Neighborhoods? ", Portland Monthly. March 2019. Print and Online. "Brief History of The Brethren Congregational Church." Evangelical Congregational Brethren Church. Trans. Joanne Krieger. Portland, OR: n.p., 2000. 1-6. Print. Bryan, Joshua Joe. Portland, Oregon's Long Hot Summers: Racial Unrest and Public Response, 1967 - 1969. Thesis. Portland State University, 2013. Portland: Portland State U, 2013. Print. Chrystal, William G. "German Congregationalism." N.p. : n.p., n.d. N. pag. Hidden Histories In The United Church Of Christ - Volume 1. United Church of Christ. Web. 13 June 2015. <http://www.ucc.org/about-us_hidden-histories>. Dunn, David. A History of the Evangelical and Reformed Church. Philadelphia: Christian Education, 1961. 245. Print. E. Horstman. "The Evangelical Synod Answers the Call of the West." The Outlook of Missions31.3 (1939): 67-70. Print. Eisenach, George J. A History of the German Congregational Churches in the United States. Yankton, SD: Pioneer, 1938. Print. Eisenach, George J. Pietism and the Russian Germans in the United States. Berne, IN: Berne, 1948. Print. Gaus, Alex, comp. The German Brotherhood: 254 Years of History from the Volga River in Russia, U.S.A., Canada, South America, and Siberia. Flint, MI: S.n., 1977. Print. Goldenstein, Kurt Edward. Colorado Dutch Hop Music Arranged for the Accordian: The Music, History, and Culture of Colorado's Germans from Russia. Colorado: Colorado Council on the Arts, 2000. Print. Green, Josie. History of the Rothe and Green Families. N.d.
Hagelganz, Heinrich. Geschichte Der Zweiten Deutschen Kongregationalen Gemeinde Zu Portland, Oregon, 1913-1932. Portland: Second German Congregational Church, 1933. Print. Hagelganz, Heinrich. The History of the Second Congregational Church in Portland, Oregon from Its Organization to the Year 1927. Rep. Portland, OR: n.p., 1927. Print. Hagelganz, Heinrich. "The Chronicle of the Church." Second German Congregational Church, Portland, Oregon, 1913-1969. Portland, Oregon: Krieger, 2001. 341-42. Print. Hagelganz, Jack. "History of the Evangelical Congregational Church." Second German Congregational Church, Portland, Oregon, 1913-1969. Portland, Oregon: Krieger, 2001. 343-45. Print. Halliday, E. M. "Bread Upon The Waters." American Heritage11.5 (1960): n. pag. Web. 5 Feb. 2018. <https://www.americanheritage.com/content/bread-upon-waters>. Haynes, Emma S. Emma's Thesis - The German-Russians on the Volga and in the United States. N.p. : AHSGR Central California Chapter, 1996. Print. Hines, Harvey K. An Illustrated History of the State of Oregon: Containing a History of Oregon from the Earliest Period of Its Discovery to the Present, Together with Glimpses of Its Auspicious Future; Illustrations and Full-page Portraits of Some of Its Eminent Men and Biographical Mention of Many of Its Pioneers and Prominent Citizens of To-day. Chicago: Lewis, 1893. Print. Hoover, Helen. "Where Does Your Garbage Go?" The Sunday Oregonian[Portland] 26 Jan. 1947: 4. Print. Hunter, Bob. "George Frank: Two Companies, Many Friends." Tigard Times[Tigard, Oregon] 25 Aug. 1981: 5A. Print. Johnson, Doug. "German and Scandinavian Influences." North Pacific Union Conference Gleaner86.13 (1991): 6. Seventh-day Adventist Online Archives. Web. 3 Sept. 2015. <http://documents.adventistarchives.org/Periodicals/NPG/NPG19910715-V86-13.pdf>. Kamphausen, Hugo. The Story of the Religious Life in the Evangelical Synod of North America. Trans. John W. Flucke. St. Louis, MO: Eden House, 1990. Print. Kelley, Barbara. "Information about Phillip Green and Anna Rothe." Telephone interview. Aug. 2016. Great granddaughter of Phillip Green and Anna Rothe. Klooster, Karl. "Little Russia: A Lost Community." The Oregonian [Portland, Oregon] 19 Aug. 1987, This Week Magazine - Round the Roses Column. Print. Klooster, Karl. "Notes and Anecdotes." The Oregonian [Portland, Oregon] 28 Oct. 1987, This Week Magazine - Round the Roses Column. Print. Kniss, Conrad. "History of the Free Evangelical Brethren Church." Free Evangelical Brethren Church Records 1900-1922. Portland, OR: n.p., n.d. 341-42. Print. Koehler, Paul. "The German Brotherhood: 272 Years of History." Journal of the American Historical Society of Germans from Russia27.4 (2004): 8-18. Print. Krieger, Joanne, Robert Beall, Marie Krieger, and Willis Krieger, trans. Second German Congregational Church, Portland, Oregon, 1913-1969. Portland: n.p., 2001. Print. Krieger, Joanne, trans. Evangelical Congregational Brethren Church, Portland, Oregon, 1922-1967. Portland, OR: n.p., 2000. Print. Krieger, Joanne, trans. "History of the Ebenezer German Congregational Church." Ebenezer Congregational Church, Portland, Oregon 1909-1984. Portland, OR: n.p., 2002. 433-36. Print. Krieger, Joanne, Willis Krieger, and Marie Krieger, trans. Free Evangelical Brethren Church Records, Portland, Oregon, 1900-1922. Portland: n.p., n.d. Print. Krieger, Joanne, Willis Krieger, Marie Krieger, and Robert Beall, trans. Zion Congregational Church, Portland, Oregon, 1914-1967. Portland: n.p., 2001. Print. Krieger, Marie. "Portland Community of Russian Germans." Journal of the American Historical Society of Germans from Russia (Fall 1987): n. pag. Print. Lockley, Fred. History of the Columbia River Valley from the Dalles to the Sea. Vol. III. Chicago, IL: S.J., 1928. Print. MacColl, E. Kimbark. The Shaping of a City: Business and Politics in Portland, Oregon, 1885-1915. Portland, Or. : Georgian, 1976. Print. Mai, Brent A. "St. Peter's Lutheran Church Blooming (Cornelius), Washington Co., Oregon." The Center for Volga German Studies. Concordia University, 21 Sept. 2011. Web. 04 Feb. 2015. <http://cvgs.cu-portland.edu/immigration/united_states/oregon/blooming/blooming_st_peters_lutheran.cfm>. Mattoon, Charles H. Baptist Annals of Oregon: 1886-1910. Vol. 2. McMinnville: Oregon State Baptist Convention, 1913. 410. Print. Mattoon, Charles Hiram. Baptist Annals of Oregon, 1844-1900. McMinnville: Oregon State Baptist Convention, 1913. Print. "Millions Starving in Lenin's Paradise of Atheism." The Literary Digest70 (1921): 32-33. Web. 3 May 2018. <https://hdl.handle.net/2027/mdp.39015028101486?urlappend=%3Bseq=348>. Moore, Elinor Allison. "Important Cities of the World." The Intelligence: A Semi-monthly Journal of Education,24 (1904): 97-98. Print. Mücke, A. Geschichte Der Deutschen Evangelischen Synode Von Nord-Amerika. Im Auftrage Der Synode Zu Ihrem Fünfundsiebzigjährigen Jubiläum Verfasst Von Albert Mücke ..St. Louis, MO, Chicago, Ill.: Eden Pub. House, 1915. 262. Print. Nelson, Donald R. The Bethany Community: As It Was...and Is Today. S.l. : Donald R. Nelson, 2007. 42-45. Print. Ochs, Grace Lillian. Up from the Volga; the Story of the Ochs Family. Nashville: Southern Pub. Association, 1969. Print. Rath, George. Emigration from Germany through Poland and Russia to the U.S.A.Salt Lake City, UT: Genealogical Society of the Church of Jesus Christ of Latter-day Saints, 1969. Print. Raugust, W. C. History of the Pacific Conference of Congregational Churches of Washington, Oregon and Idaho, 1897-1964. N.p. : n.p., n.d. Print. Raugust, W. C., Robert Hoefel, Alex Rehn, and Albert Hausauer. History of the Pacific Conference of Congregational Churches of Washington, Oregon and Idaho, 1897-1963. Place of Publication Not Identified: Publisher Not Identified, 1964. Print. Robertson, Donald B. Encyclopedia of Western Railroad History: Volume III Oregon Washington. Caldwell, ID: Caxton Printers, 1995. Print. Roos, Roy E. The History of Albina: Including Eliot, Boise, King, Humboldt, and Piedmont Neighborhoods. Portland, Oregon: S.n., 2008. Print. Sallet, Richard. Russian-German Settlements in the United States. Fargo: North Dakota Institute for Regional Studies, 1974. Print. Scheuerman, Richard D. "From Wagon Trails to Iron Rails: Russian German Immigration to the Pacific Northwest." Journal of the American Historical Society of Germans from Russia2.2 (1979): 37. Print. Scheuerman, Richard D., and Clifford E. Trafzer. Hardship to Homeland Pacific Northwest Volga Germans. Pullman, WA: Washington State UP, 2018. Print. Scheuerman, Richard D., and Clifford E. Trafzer. 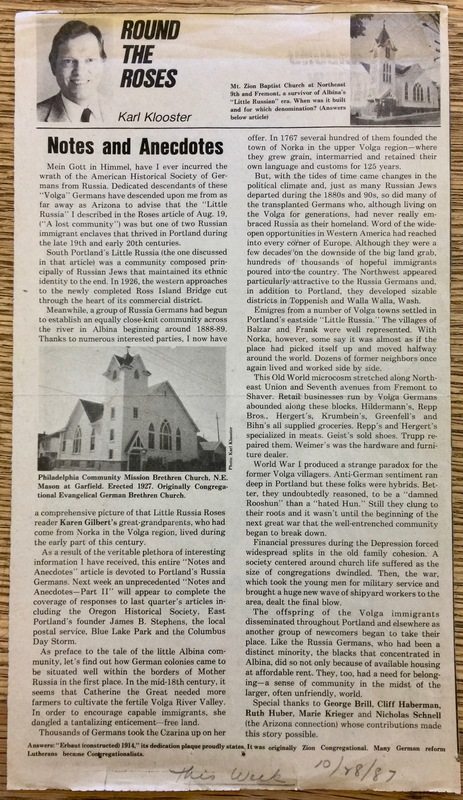 The Volga Germans: Pioneers of the Northwest. Moscow, ID: U of Idaho, 1980. Print. Schwabauer, Wanda J. 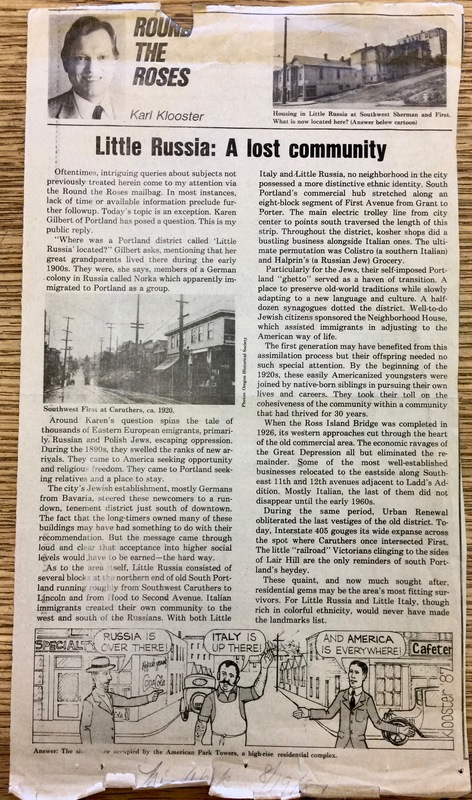 "The Portland Community of Germans from Russia." Diss. Portland State U, 1974. Print. Taylor, Richard H. Congregations of the German Evangelical Synod of North America and Related Groups. Benton Harbor, MI: R.H. Taylor, 1998. Print. Tripp, Julie. "Cleaning Up Portland." The Oregonian [Portland] 26 Dec. 2005: n. pag. Print. Weitz, Anna Green. "Story of a Pioneer." Ed. P. D. Niles. Endicott Index [Endicott, Washington] 29 Nov. 1935: n. pag. Print.